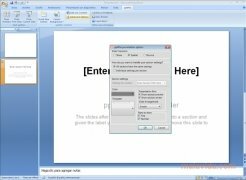 pptPlex is a plug-in for the presentation program integrated into Microsoft Office, PowerPoint. It is a development designed to optimize the documents that you want, by including more eye-catching transitions and more complex effects than those that are included in the program by default. 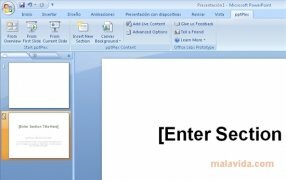 This utility, that integrates perfectly with PowerPoint's Ribbon interface (adding a new tab from which you will be able to use its tools), will offer you the possibility to change how you carry out your presentations, because it's possible to create a master slide from which you can quickly access all the information sections, without having to visit each page to reach the most important data. 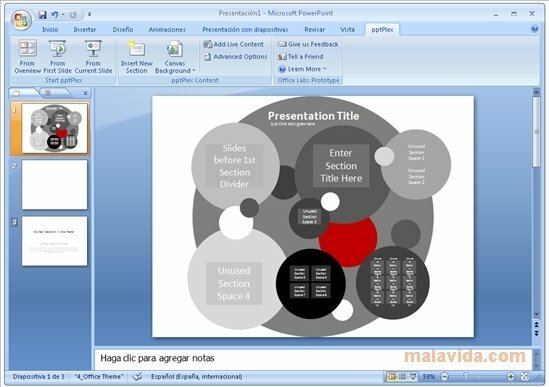 Discover the quickest way to graphically improve your PowerPoint documents. 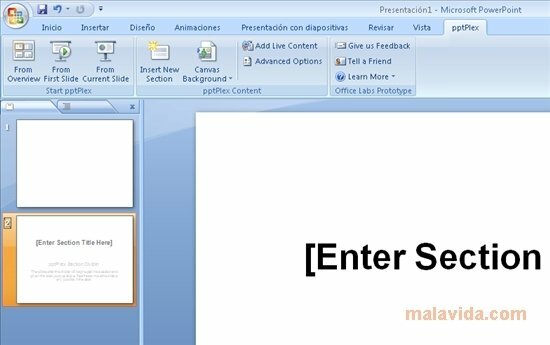 It's a development that can be somewhat complex to use if you are used to using PowerPoint in the traditional method, but if you spend some time learning how to use it, it will completely change how you work with the Office slideshow tool. This download requires Office 2007 or above.